The Technique sat down with senior distance runner Jeremy Greenwald, who added to his already impressive list of accomplishments last weekend by setting a new school record in the 3000m with a time of 8:03.13 at the Vanderbilt Commodore Invitational. Technique: How did it feel to get back out there after having a little layoff? Greenwald: It feels great. I actually haven’t raced indoor in two years since I was injured last year, so it’s definitely nice to be back. I love indoor track, just the atmosphere is a little different than outdoor. It’s more confined, everyone is screaming, it echoes off the ceiling and everything, it’s just insane. Technique: Would you say it’s your favorite of the three seasons because of that? Greenwald: Not necessarily. I can’t choose between indoor and outdoor, but track is definitely my favorite. It’s a nice change of pace going from cross country to indoor and then outdoor. Technique: What was your injury that forced you to sit out last indoor season? Greenwald: Well, who knows exactly what it was. I had a lower back injury and it has still kind of stuck with me a little bit, but it started during cross country. I’ve seen a whole lot of doctors about it and all the tests come back negative, so we’re doing some physical therapy now to get on top of it. It seems to be working so far. Technique: How had you been preparing for indoor since the end of the cross country season? Greenwald: Cross country ended on a pretty terrible note. We didn’t really run as well as we thought we could at the regional meet, so we took a couple of weeks to just reflect on the season and think about what we could have done better. We took a little time off from running to get our heads straight and get back in the swing of things. Over Christmas break we started training on our own and getting back into workouts, and when we came back to school we really started putting the work in. That was just a couple of weeks ago, and it really has me excited for the rest of the season, that we can run the way we did [on Saturday] after just a couple weeks of training. Technique: What enabled you to set a new school record in the 3000m? Greenwald: I don’t know what enabled me, but I think it has been a long time coming. It was just the accumulation of all of the work I had put in over the last five years. It kind of came full circle: I paced the guy who had the record [D.J. McMillan] until I broke it this past weekend, and that was four years ago. He taught me how to run, and now that I’m the record holder I am hopefully leaving behind a good example for the younger guys. Hopefully one of them can break the record again in a few years. 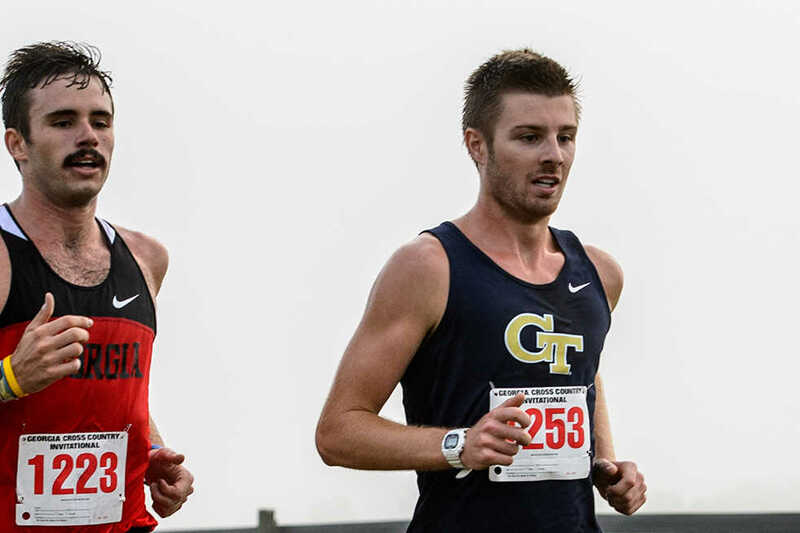 Technique: You’ve accomplished a lot in your running career at Tech. Where does this achievement rank? Greenwald: It’s pretty important. It’s always nice to have a school record. I have a couple, but they’re shared with my relay team members. Those are special too, but it’s nice to have one with only my name on it. I know that I have put in a lot of work and that I deserve whatever I am getting, but it’s nice to have that recognition. It probably ranks right behind qualifying for nationals [in the 1500m] my junior year in outdoor track. Technique: What was your racing strategy for this event? Greenwald: My strategy was to be a little conservative in the early part of the race. To be honest I wasn’t very confident since I have had this injury for a while and since cross country didn’t go well. I didn’t really know what to expect out of myself or what kind of fitness I was in. I was going to be conservative for the first mile or so and then if I felt good I’d pick it up. I ended up latching onto the back of the front pack and they pulled me through pretty quickly, and I was able to negative split the last half (meaning that the second half of the race was faster than the first half), which is very promising leading into the rest of the season. The fact that the second half of my race was 10 seconds faster than the first half means that I could have gone a little faster if the race was more evenly split. I’m looking forward to getting back out there and trying again, hopefully to break eight minutes. Technique: Across all three seasons, is this the event that you would say you tend to perform the best at? Greenwald: I kind of see myself as a pure miler with quite a bit of range. I’ve competed in the 800m up to the 5K, plus cross country which is 10K and I’m relatively decent at all of those events. I’m kind of transferring into being a mile/3000m guy instead of a mile/800m guy. Technique: What are your expectations, both as you see yourself and the team performing over the course of this season? Greenwald: For myself, I would like to break four minutes in the mile, and I will try to do that in two weeks at Vanderbilt again. I would also like to qualify for nationals, whether it is in the 3000m or the mile, and that is going to take about a 3:58 in the mile and 7:53 or so in the 3000m. The top 16 times in the nation go to the national meet, and it is a huge goal. It’s so hard to get in there because everyone is just insanely good. As far as the team goes, we would like to place well at ACCs. Being in the top half of the teams would be great for us since we don’t have a huge team and we only focus on certain events.